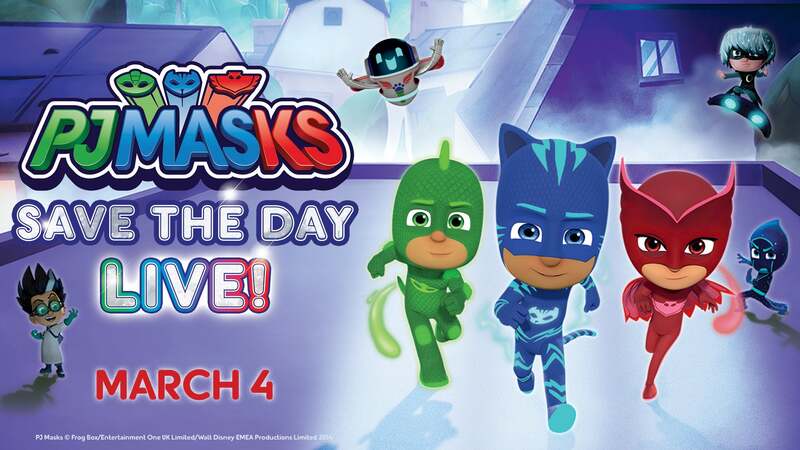 ‘PJ Masks Live!,’ the hit live musical production from Entertainment One (eOne) and Round Room, is back with an all-new show, “PJ Masks Live: Save The Day!” The show will make a stop at Wagner Noël Performing Arts Center on March 4, 2019. In addition to the new tour, the Original Cast Recording for ‘PJ Masks Live!’ is now available for purchase and streaming everywhere. The album features many well-loved songs from the series recorded by the cast of the first ‘PJ Masks Live!’ tour. *ALL PATRONS, REGARDLESS OF AGE, WILL REQUIRE A TICKET FOR ENTRY FOR ALL TICKETED PERFORMANCES. Copy of the newly released Original Cast Soundtrack from “Time To Be A Hero”! The Meet & Greet event will start shortly after the end of show and last approximately 30 minutes. Please make sure to bring your camera, as you will want to capture every superhero moment! Mix 97.9 and Wagner Noël Performing Arts Center are teaming up to host a FREE PJ Party on Sunday, February 10th, in preparation for our PJ Mask Live: Save the Day! performance on March 4th! Your little ones are encouraged to come dressed up in their PJs! We hope to see you this FREE event! Mix 97.9 will be broadcasting live throughout the event and be on site to craft with attendees! This event will be held in the REA-Greathouse Recital Hall located inside the Wagner Noël Performing Arts Center - please enter through the far west doors (where you would enter for the Box Office). *Please note the characters from the show will NOT be in attendance at the PJ Party. Join Wagner Noël Performing Arts Center as we team up with Midland County Centennial Library for a PJ Masks Day! This free event will feature a PJ Masks story time followed by making your own superhero mask. We will be giving away a family 4 pack of tickets to PJ Masks on March 4th to one lucky family in attendance! Storytime will start promptly at 11:15 AM. We hope you can also join us for PJ Masks Live: Save the Day! at Wagner Noël Performing Arts Center on March 4th.